Uteroplacental insufficiency in the rat restricts fetal growth, impairs mammary development, compromising postnatal growth; and increases adult BP. The roles of prenatal and postnatal nutritional restraint on later BP and nephron endowment in offspring from mothers that underwent bilateral uterine vessel ligation (restricted) on day 18 of pregnancy were examined. Sham surgery (control) and a group of rats with reduced litter size (reduced; litter size reduced at birth to five, equivalent to restricted group) were used as controls. Offspring (control, reduced, and restricted) were cross-fostered on postnatal day 1 onto a control (normal lactation) or restricted (impaired lactation) mother. BP in male offspring was determined by tail cuff at 8, 12, and 20 wk of age, with glomerular number and volume (Cavalieri/Physical Dissector method) and renal angiotensin II type 1 receptor (AT1R) mRNA expression (real-time PCR) determined at 6 mo. Restricted-on-restricted male offspring developed hypertension (+16 mmHg) by 20 wk together with a nephron deficit (−26%) and glomerular hypertrophy (P < 0.05). In contrast, providing a normal lactational environment to restricted offspring improved postnatal growth and prevented the nephron deficit and hypertension. Reduced-on-restricted pups that were born of normal weight but with impaired growth during lactation subsequently grew faster, developed hypertension (+16 mmHg), had increased AT1AR and AT1BR mRNA expression (P < 0.05), but had no nephron deficit. Our study identifies the prenatal and postnatal nutritional environments in the programming of adult hypertension, associated with distinct renal changes. It is shown for the first time that a prenatally induced nephron deficit can be restored by correcting growth restriction during lactation. In humans, intrauterine growth restriction contributes significantly to perinatal morbidity and mortality and increases the predisposition to adult disease (1). Many studies across various populations have shown that being thin or light at birth is strongly and consistently associated with cardiovascular disease in adults (1–5). This is considered to reflect environmental modulation of prenatal growth and functional development, rather than a genetic predisposition to disease. Recent studies also suggest that whereas catch-up growth early in infancy (during the first year) may be beneficial in preventing later disease, accelerated growth later in childhood, particularly in those of low birth weight, independently predicts the risk for particular adult diseases (3,6). Many experimental perturbations have been used to investigate the underlying mechanisms of the association between low birth weight and adult disease, the most common being exposure of the mother to a low-protein diet or global calorie restriction throughout all or part of pregnancy. However, in Western society, intrauterine growth restriction occurs in approximately 10% of pregnancies and is most commonly due to a poorly functioning placenta, rather than maternal undernutrition. Bilateral uterine vessel ligation in the rat that results in uteroplacental insufficiency causes a decrease in oxygen and nutrient supply to the fetus, restricting fetal growth and litter size (7–9). In addition, uteroplacental insufficiency in the rat increases basal and stressed BP while reducing the number of glomeruli (and therefore nephron number) (10,11). This is consistent with the consequences of other prenatal challenges in the rat, in which maternal undernutrition or glucocorticoid treatment at crucial stages of renal development reduces nephron number and induces adult hypertension (12,13). Growth-restricted human infants also have fewer nephrons (14), with a strong association found between nephron endowment and birth weight (15). Early postnatal growth, as indicated by weight at 1 yr, is also a predictor of adult BP in humans (16), suggesting that the postnatal environment also influences cardiovascular function in the longer term. Recently we found that placental insufficiency in the rat impairs mammary adaptation during pregnancy in preparation for lactation and causes reduced milk production and altered milk composition (17–19). This in turn alters postnatal development and growth and potentially contributes to the later adverse cardiovascular outcomes that others have described (10,11). In this study, our aim was to assess growth, nephron endowment, and BP of male offspring that were born to placentally restricted mothers. Furthermore, we aimed to determine whether these parameters could be modulated by altering the postnatal (lactational) environment by cross-fostering. We hypothesized that placental restriction would reduce nephron endowment in adult offspring, which would be associated with an increase in BP. Because nephrogenesis in the rat continues for at least 1 wk postnatally, we further hypothesized that cross-fostering a pup from a placentally restricted mother onto a control mother at birth would overcome the prenatally induced nephron deficit by restoring early postnatal nutrition during lactation and thereby normalize adult BP. In addition, the effect of placental restriction on the renal expression of angiotensin receptors was examined. A range of prenatal perturbations alter the expression of the angiotensin II type 1 and 2 receptors (AT1R, AT2R) in the fetus and adult, which are required for normal kidney development and regulation of BP and renal function in the adult (20,21). We hypothesized that alterations in the renal renin-angiotensin system (RAS) would occur after placental insufficiency because this is a common underlying mechanism through which an in utero perturbation can contribute to adult hypertension. All experiments were approved by the University of Melbourne Pharmacology, Physiology, Biochemistry & Molecular Biology and Bio21 Institute Animal Ethics Committee (AEC no. 05120) before commencement. Wistar Kyoto rats (9 to 13 wk of age) were obtained from the Australian Resource Centre (ARC, Murdoch, WA, Australia) at least 1 wk before mating. They were provided with 12-h light/dark cycle and had access to food and tap water ad libitum. A vaginal impedance reader (Model MK-10B; Muromachi Kikai Co. Ltd., Osaka, Japan) was used to determine whether female rats were in the appropriate stage of the estrus cycle for mating as described previously (22). The next morning, presence of sperm in vaginal smears was taken as day 1 of pregnancy. On day 18 of gestation, pregnant rats were randomly allocated into restricted or control (sham surgery) groups. The restricted group underwent bilateral uterine vessel (artery and vein) ligation to induce placental insufficiency as described previously (22). At birth, half of the litters from the control (sham surgery) group had their litter size randomly reduced to five to match the restricted group (reduced litter size of control from 10 to 14 pups to five pups). Pups from each of the three groups—control, reduced, and restricted (placental restriction)—were cross-fostered 1 d after birth onto a control (sham surgery) or restricted (placental restriction surgery) mother. This resulted in six experimental groups: Control-on-control, control-on-restricted, reduced-on-restricted, reduced-on-control, restricted-on-control, and restricted-on-restricted (n = 7 to 10 mothers per group). There were even gender ratios across all litters. After cross-fostering, mothers remained undisturbed in the same cage as they had delivered. Pups were toe-clipped on postnatal day 3 for identification purposes. Because the lactational environment is a key part of this study, pups were allowed to wean naturally rather than being forced to wean at 21 to 25 d as is performed in many studies. We have preliminary evidence to suggest that some groups (those on restricted mothers) suckle past day 25; therefore, pups were removed from the dams at day 35. The duration of lactation is not likely to affect nephron endowment because nephrogenesis is complete within 10 d of birth. One to two male pups per litter (n = 7 to 10 litters per group) resulted in 9 to 10 males being studied per group. Body weight was measured on postnatal days 1, 14, 21, and 28 and at post mortem (6 mo). Systolic BP was measured at 8, 12, and 20 wk by an indirect, tail-cuff method using a programmed electrosphygmomanometer with a pneumatic pulse transducer (PE-300; Narco Bio-System, Houston, TX) (23,24). At 6 mo, rats were anesthetized with an intraperitoneal injection of a mixed solution that contained Ketamine (Parnell Laboratories, Pty. Ltd., Alexandria, NSW, Australia; 50 mg/kg body wt) and Ilium Xylazil-20 (Troy Laboratories, Pty. Ltd., Smithfield, NSW, Australia; 10 mg/kg body wt). The right kidney was weighed and fixed in 10% neutral-buffered formalin for subsequent analysis of nephron number. The left kidney was frozen in liquid nitrogen and stored at −80°C for subsequent extraction of RNA and protein. The kidney was cut into 1-mm slices; every second slice was taken for processing, and the first slice chosen at random. The slices were dehydrated, then infiltrated with Technovit 7100 resin, Harderner I (Haraeus Kulzer, Hanau, Germany) for 2 to 3 d and embedded into glycolmethacrylate (Technovit 7100 resin, Harderner II, Haraeus Kulzer). Blocks were exhaustively sectioned at 20 μm. Every 10th and 11th section was sampled, the first of which was chosen randomly. Sections were stained with periodic acid-Schiff reagent. Total kidney volume (Vkid) was estimated using the Cavalieri principle, and total nephron number per kidney was estimated using the Physical Dissector method as described previously (25): Nglom, kid = (Q−/2) × (1/fa) × (PS/PF) × 10 × 2, where Q− is the number of glomeruli counted, 1/fa is the inverse fraction of area used to count glomeruli, PS is the total number of points overlying all tissue, PF is the total number of points overlying tissue for complete sections, 10 is the inverse of section sampling fraction, and 2 is the inverse of slice sampling fraction. Total RNA was extracted using the Micro-to-Midi Total RNA Purification System kit (Invitrogen, Life Technologies, Carlsbad, CA). Reverse transcription and real-time PCR were performed as described previously (22) for AT1AR, AT1BR, and AT2R. Primer and probe sequences along with optimal concentrations are shown in Table 1. Real-time PCR results were analyzed using the sequence detector software (Rotor-Gene v6; Corbett Research, Mortlake, Australia). Relative quantification of gene expression was performed by the comparative CT (ΔΔCT) method with ribosomal 18S as the endogenous control. Protein concentration was determined from kidney homogenates using a Bradford protein assay. A total of 50 μg of protein was loaded onto a 7.5% SDS polyacrylamide gel as described previously (21) and transferred onto a nitrocellulose membrane (Schleicher and Schuell, Bartell Instruments, Middlesex, UK). Adequate transfer was checked by staining the membrane with Ponceau S stain. Nonspecific binding was blocked with 5% nonfat dry milk powder in Tris-buffered saline for 1 h and incubated overnight at 4°C with the primary antibody for the AT1R (Santa Cruz Biotechnology, Santa Cruz, CA) at a 1:1000 dilution in 5% BSA in Tween Tris-buffered saline. On the following day, filters were washed and incubated for 1 h at room temperature with affinity purified peroxidase conjugated anti-rabbit IgG diluted 1:4000 (Cell Signaling Technology, Cummings Centre, Beverly, MA). The membrane was washed and incubated for 1 min in enhanced chemiluminescence reagent (Amersham Int., Buckinghamshire, UK), after which they were exposed to an x-ray film (Kodak Biomax-ML, Collingwood, Australia) for 40 s. Relative density of bands was assessed using a densitometer and SynGene Gene Tools analysis software (SynGene Laboratories, Cambridge, UK). For group comparisons, data were analyzed by one-way ANOVA followed by Student-Newman-Keuls test for post hoc comparisons (SPSS-X; SPSS. Encinitas, CA). Data are presented as means ± SEM, and P < 0.05 was taken as statistically significant. No more than two littermates from one mother were used in each cross-foster group. Placental insufficiency reduced litter size (P < 0.05; Table 2). Male pups had lower body weights on postnatal day 1 (restricted-on-restricted −16.3% and restricted-on-control −18.2%, respectively), and this persisted to day 14 regardless of cross-fostering (P < 0.05; Table 2). Restricted-on-restricted male pups were lighter during lactation (days 1 to 28; by 25 to 32%; P < 0.05) and up to 6 mo (by 9%; P < 0.05) compared with control-on-control offspring. Restricted-on-control male pups were lighter than control-on-control at day 1 (P < 0.05) but caught up in part, being lighter than control-on-control but heavier than restricted-on-restricted at day 14 (P < 0.05). By day 21, the restricted-on-control pups were of similar weight to control-on-control. Control-on-restricted pups were of similar body weight to control-on-control at all ages examined. 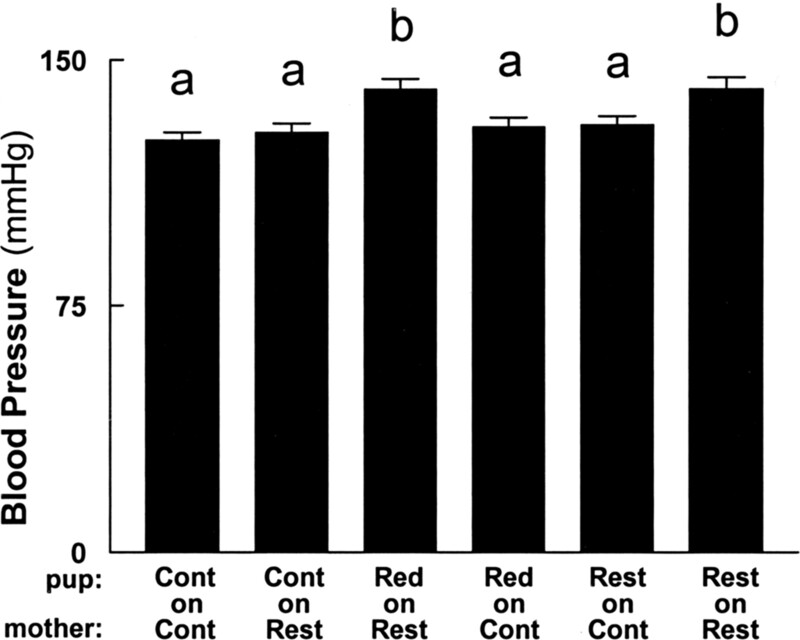 Reduced-on-restricted pups were of similar body weight to controls on day 1; however, their growth subsequently slowed during lactation such that they were smaller (7 to 12%) than control-on-control and control-on-restricted groups at day 14. By day 21, the body weight of the reduced-on-restricted was intermediate between control-on-control and restricted-on-restricted groups. Placental restriction reduced total kidney weight at 6 mo (by 10%) compared with control-on-control (P < 0.05; Figure 1A), whereas relative kidney weight was unaltered across cross-foster groups (Figure 1B). Kidney volume was reduced in restricted offspring compared with control-on-restricted (P < 0.05; Figure 1C) but not compared with control-on-control offspring. Glomerular number was similar in the control and reduced litter cross-foster offspring (Figure 2A). Restricted-on-restricted male pups had decreased total glomerular number compared with control-on-control offspring (−26%; P < 0.05; Figure 2A) but increased individual glomerular volume (+27%; P < 0.05; Figure 2B). Consequently, total glomerular volume was not altered across cross-foster groups (Figure 2C). Cross-fostering restricted offspring onto control mothers increased total glomerular number as compared with restricted-on-restricted (+24%; Figure 2A); restricted-on-control offspring were not different from control-on-control offspring. There were similar changes in corpuscle volumes (data not shown). BP was not altered in any cross-foster group at 8 and 12 wk of age (Table 3). Restricted offspring as well as reduced offspring that were cross-fostered onto restricted mothers had increased BP at 20 wk (restricted-on-restricted +15.5 mmHg and reduced-on-restricted +15.6 mmHg, respectively; P < 0.05; Figure 3) compared with control-on-control offspring. Cross-fostering of restricted offspring onto control mothers normalized BP at 20 wk (P < 0.05; Figure 3). There were no differences in absolute heart weight across the groups, although heart weight (as a percentage of body weight) was lower in reduced-on-restricted compared with the reduced-on-control male pups (P < 0.05; Table 3). 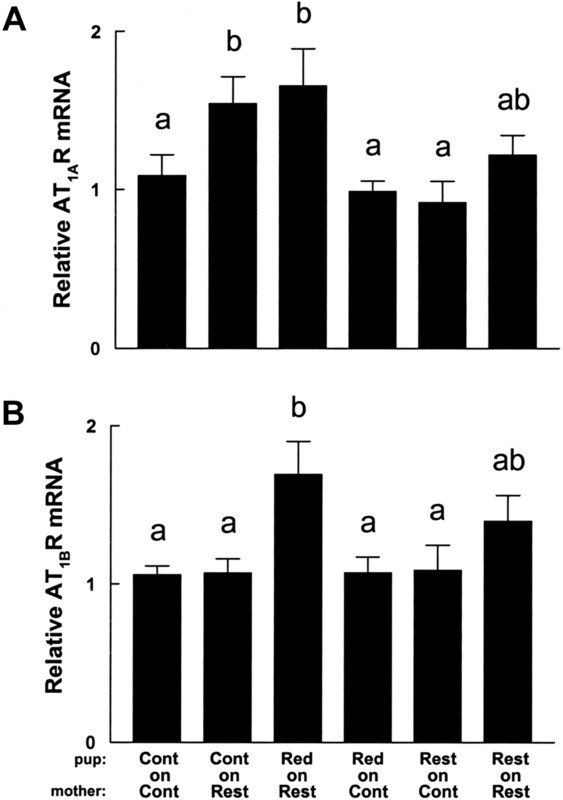 Renal AT1AR mRNA expression was increased in control-on-restricted and reduced-on-restricted male pups compared with control-on-control (by +42% and +52%, respectively; P < 0.05; Figure 4A), whereas there was a small but nonsignificant increase in restricted-on-restricted male pups (by +12%; Figure 4A). AT1BR mRNA expression was also increased in reduced-on-restricted offspring compared with control-on-control (+66%; P < 0.05; Figure 4B), although, the increase (+37%) was NS in restricted-on-restricted male pups (Figure 4B). Renal AT2R mRNA expression was not detectable after 40 cycles of PCR in any of the tissues examined. AT1 protein concentrations were measured by Western blot analysis in the groups in which gene expression differences had been detected. Relative optical density and AT1 protein concentration was 32,898 ± 1472 (mean ± SEM) in control-on-control, 33,327 ± 590 in restricted-on-restricted, and 37,779 ± 1739 in reduced-on-restricted male pups. Densitometry revealed an increase in AT1 protein in the reduced-on-restricted group (P < 0.05) compared with the other two cross-foster groups analyzed (data not shown). This study confirms that uteroplacental insufficiency and its associated impaired lactation can lead to adult hypertension, which correlates with a low nephron number. Of great significance, we have shown for the first time that this reduction in nephron number can be corrected by suckling a pup that is born small onto a control mother to provide a normal lactational environment and improved early postnatal growth. It is interesting that changing postnatal conditions by reducing litter size, together with an impaired lactational environment, slows growth during late lactation, accelerates growth after weaning, and also results in the development of adult hypertension. However, the hypertension that was induced by restricted lactation only increased in renal AT1R mRNA expression and did not involve a reduction in nephron endowment. This suggests that different prenatal (in utero) and postnatal (lactational) environments can program hypertension via different renal-specific mechanisms. One recent study used a similar uteroplacental insufficiency model in the rat and also showed a reduction in nephron endowment (11). The same group recently showed that uteroplacental insufficiency also results in elevated BP in male offspring at 6, 9, and 12 mo of age (10). However, these studies did not separate the effects of placental insufficiency from that of its effects on mammary function and thus postnatal environment; neither was the timing of hypertension onset examined. In this study, we used the tail-cuff method to perform sequential BP measurements in the same animals. Uteroplacental insufficiency combined with lactational restraint or lactational restraint alone caused onset of hypertension in offspring between 3 and 5 mo. The use of tail-cuff BP measurements means that BP was being examined under at least mildly stressed condition, indicating that the outcomes for basal BP remain unknown at this stage. Future studies that incorporate the use of telemetry for accurate measurement of basal BP are therefore warranted. A low nephron endowment has been suggested as an underlying causative factor in the development of essential hypertension (26,27). Recent studies in humans have shown a strong association between glomerular (thus nephron) number and BP (15,28). There is also a strong correlation between birth weight and glomerular number in humans, with an estimated increase of approximately 250,000 nephrons for each kilogram increase in birth weight (15). Because no new nephrons can be formed after birth, this suggests that human infants that are born small are likely to be born with fewer nephrons and be more susceptible to cardiovascular complications, including hypertension. Outcomes from studies that used a range of animal models of developmental programming of cardiovascular function have in general supported this aforementioned concept (for review, see reference ). Exposure of the mother to a low-protein diet throughout all or part of pregnancy often results in offspring that are born small, have a reduced nephron endowment, and develop hypertension (30). However, this is not universally true, with some studies demonstrating that a decrease in nephron endowment does not necessarily result in hypertension (27). The final outcome depends on gender of the offspring as well as the timing, severity, and quality of diet provided. We chose to use a placental insufficiency model to investigate the long-term consequences of being born small, because this is the major cause of low birth weight in Western society. Induction of placental insufficiency in rats on day 18 of pregnancy (term 22 d) coincides with the early stages of nephrogenesis in the rat, and at birth, <20% of nephrons are formed (31). Nephrogenesis continues into early lactation (up to postnatal day 10), when the remaining 80% of nephrons are formed. In our model, placental restriction is likely to have an impact on early nephrogenesis, reducing nephron endowment at birth. Studies have highlighted the importance of the perinatal period in the programming of a low nephron number and subsequent hypertension in many models, including maternal glucocorticoid exposure (sheep and rat) and maternal undernutrition (sheep and rat) (27). The mechanisms through which early nephrogenesis may be affected are unknown but could involve increased apoptosis (32) or a decrease in the rate of branching morphogenesis. The 26% reduction in nephron number that was observed here in adult offspring at 6 mo of age was associated with an increase in glomerular volume. This is in agreement with other studies in the rat of maternal undernutrition models in which a reduced nephron endowment is associated with glomerular hypertrophy (30). This occurs presumably to maintain glomerular filtration surface area and thus GFR. In this study, nephron endowment was examined at 6 mo of age, allowing us to characterize nephron endowment, growth, and BP in the same individual animals. Therefore, although it is most likely that the nephron deficits that were observed after restriction in utero were established before birth, this requires direct confirmation. It is also possible that the lower nephron number in those that developed hypertension and had enlarged glomeruli may be due in part to glomerular loss (glomerulosclerosis). However, a study at 21 wk of age in male rat offspring after maternal exposure to low protein and a similar reduction in nephron number and elevations in BP, as seen in our study, demonstrated no glomerulosclerosis (33). This suggests that glomerular loss is unlikely to play a large role in the nephron deficit. To resolve these issues, future studies should be performed to determine the time of onset of nephron deficits, whether it occurs before the development of hypertension and glomerular hypertrophy, and the extent, if any, of glomerulosclerosis. In contrast, the impaired lactational environment that was present in rats that were cross-fostered onto a restricted mother after birth is likely to affect the later stages of nephrogenesis and renal development. Our results suggest that both prenatal and postnatal periods are important in the programming of hypertension in the rat, acting through distinctly different mechanisms. The most severe phenotype results when all stages of nephrogenesis are challenged—that is, when both the prenatal and postnatal environments are suboptimal (restricted-on-restricted). This resulted in offspring that were born small, remained small throughout life, and in adulthood had a reduced nephron endowment (by 26%) and overt hypertension. Similar decreases in nephron number have been reported in studies that used maternal low-protein exposure in the rat (30,34). Furthermore, this study shows that impairment of the postnatal environment alone after nephrogenesis is complete (control or reduced-on-restricted) does not reduce nephron endowment, although it can lead to altered growth and elevations in BP (reduced-on-restricted group). However, the most astounding finding of this study was that cross-fostering a growth-restricted pup onto a mother with normal lactation (restricted-on-control) was sufficient to restore nephron endowment and prevent the onset of adult hypertension. These rats received improved nutrition throughout the period of late nephrogenesis and underwent accelerated growth during early lactation, such that they were of similar size to control-on-control rats by 4 wk of age. This suggests that whereas a poor lactational environment may not impair nephron formation, an improved environment can enhance nephrogenesis. Although it is tempting to attribute the prevention of hypertension to the restoration of nephron endowment as a result of postnatal nutritional rescue, we cannot discount that this is coincidental rather than causal. Therefore, it is possible that the improved lactational environment has affected other aspects of development, including that of the cardiovascular system or factors that influence this and so prevented the onset of hypertension via other pathways. However, it would be of potential clinical interest to understand the mechanism that controls the compensatory increase in nephron number that we observed in our restricted-on-control male pups. One theory is that it may involve an extension in the nephron formation period, which has been demonstrated in a sheep model of increased nephrogenesis after fetal unilateral nephrectomy (35). Most other studies of cardiovascular outcomes for offspring of prenatal perturbations in the rat have not used the cross-fostering techniques that we used. In nearly all cases, studies that used protein-restricted diets during pregnancy had a normal diet immediately after birth (30,33,36–39). Mammary development is nevertheless likely to be substantially altered in these mothers, adversely affecting lactation and hence postnatal nutrition in pups. Furthermore, the role of the early postnatal environment alone in programming later hypertension has not been previously examined. In the few studies in which cross-fostering was used, offspring that were born of normal birth weight and were nursed by mothers that had a low-protein diet during lactation remained smaller throughout life (40,41). This highlights that accurate determination of mammary function is required to understand postnatal growth consequences in many experimental models. Human studies have demonstrated that greater weight gain in infancy is associated with decreased risk for later disease (16,42,43). This and our results suggest that accelerated growth after being born small may be advantageous if it occurs during early postnatal life. In contrast, accelerated growth after a period of slow growth in late lactation may be detrimental. An unexpected finding of this study was the increased BP in the reduced-on-restricted group at 5 mo of age, suggesting that hypertension may be a consequence of an altered postnatal environment, even if the offspring were exposed to a normal prenatal environment, were of normal birth weight, and had a normal nephron endowment. This group showed signs of slowed growth during lactation, as evidenced by decreased weight at 14 to 21 d (after nephrogenesis is complete), but underwent accelerated growth after weaning when this lactational restriction was removed. When a restricted mother with impaired lactation suckles fewer control pups (reduced-on-restricted), pup weight is reduced in late lactation as a result of poor milk quality and quantity (17). In contrast, the suckling stimulus of a normal litter size of control pups that are cross-fostered onto a mother with impaired lactation (control-on-restricted) stimulates increased lactational nutrition, resulting in normal postnatal growth and adult normotension. This suggests that even with normal intrauterine development and a normal nephron endowment, hypertension can result if postnatal growth is poor (after nephrogenesis is complete) but there is accelerated growth at a later time point (after weaning). This study demonstrates that a reduced nephron endowment is not necessarily causal in programming hypertension. This is of great relevance to the human, in whom nephron endowment is complete at birth. It could be speculated that children who are born of normal birth weight and have a full complement of nephrons could still develop hypertension if their growth is inhibited in the postnatal period but they undergo accelerated growth later. Rapid weight gain in early childhood is known to be associated with negative cardiovascular consequences, including hypertension (16,44). The increase in BP in the reduced-on-restricted group was associated with increased expression of both subtypes of AT1R. Changes in expression of components of the renal RAS are also altered in protein-restricted and glucocorticoid exposure models of developmental programming (21,45). However, these changes have been demonstrated primarily in fetal or relatively young animals, in which they may contribute to alterations in renal development. Fewer studies have focused on older animals, in which alterations in expression of key elements of the renal RAS may contribute to the development of hypertension. There is now evidence to suggest that increased activation of this system may cause sodium retention and contribute to sustained elevations in BP (46). It is of note that all groups that were cross-fostered onto restricted mothers showed an increase in expression of AT1R, suggesting that an impaired lactational environment can have an impact on the long-term regulation of the renal RAS. Postnatal growth of control-on-restricted pups was not affected by lactational restriction as a result of the ability of a larger number of normal pups to increase the total suckling stimulus on the mammary glands, promoting improved mammary function (M.E.W., unpublished observations, 2005). These pups had increased AT1AR mRNA expression but no signs of hypertension at 5 mo of age. However, these offspring may have other programmed deficits or diseases that may emerge at a later age or when exposed to an insult such as a high-fat or high-salt diet. The ability of the postnatal environment to alter AT1R mRNA expression is supported in a study in which renal AT1R mRNA expression was increased in rats that were fed a low-protein diet as adults (47). It cannot be discounted that the increase in adult renal AT1R expression at 6 mo of age is a consequence of hypertension rather than having resulted from the placental insufficiency that is induced during pregnancy. This question will be addressed by future studies in which renal AT1 expression will be quantified before the development of hypertension. Use of the placental restriction model in the rat, combined with a cross-fostering approach, allowed us to identify the critical periods of renal development that are associated with the programming of adult hypertension. Our findings highlight the importance of the postnatal environment (during lactation and after weaning) in affecting the development of hypertension. This supports the findings in humans, in whom accelerated weight gain in early childhood (after 1 yr of age) (16) is associated with an increased susceptibility to cardiovascular disease and its risk factors, including hypertension. The finding that an improved early postnatal environment can restore nephron endowment also provides a model in which factors that control nephrogenesis can be further investigated. The ability to manipulate nephrogenesis after birth may have significant clinical relevance for human infants who are born preterm, when nephrogenesis is still continuing. We thank Channel 7, the National Heart Foundation of Australia, the National Health and Medical Research Council of Australia (NH&MRC), and the University of Melbourne for grant support. K.M.M. is supported by an NH&MRC Career Development Award, and A.L.S. is supported by an NH&MRC Peter Doherty Fellowship. We also thank Debbie Bartal for performing Western blot analysis. See the related editorial, “Developmental Hypertension, Nephrogenesis, and Mother's Milk: Programming the Neonate,” on pages 1626–1629.